Just like a 'paper' teacher planner - only better! From only $24.95, the teacher eDiary has been designed to look just like your hardcopy planner with Subject/Period, Lesson Outlines and Homework columns. The Teacher eDiary is a paperless planner that allows you to view tomorrow’s lessons today. It pre-loads every one of your timetabled subjects & classes across the entire teaching year....all you have to do is start adding your lesson plans. Most teachers will be happy to add quick notes directly onto the screen; however the Teacher eDiary also provides a detailed lesson and homework function. With the handy forward and back functions, you can quickly go to your next scheduled class and add homework or check what you taught, faster than turning a page! You can even add homework reminders and view a list of the lessons you have planned for a specific class or subject. The Teacher eDiary is supported by the NEW Teacher eDiary App* which allows teachers to view their lesson plans from the convenience of their mobile phones or tablet whenever they need to access them quickly in the classroom, at home or on the go. *Please note, this App is an addition to the Online Teacher eDiary and will not be useable without first setting up the Online Teacher eDiary on your PC or Mac. How much does the Teacher eDiary cost? Now in its seventh year, we continuously fine tune the Teacher eDiary to meet the demands of teachers. With our all new drag and drop timetable setup feature and pre-set term dates you’ll find setting up your term timetables quick and easy. 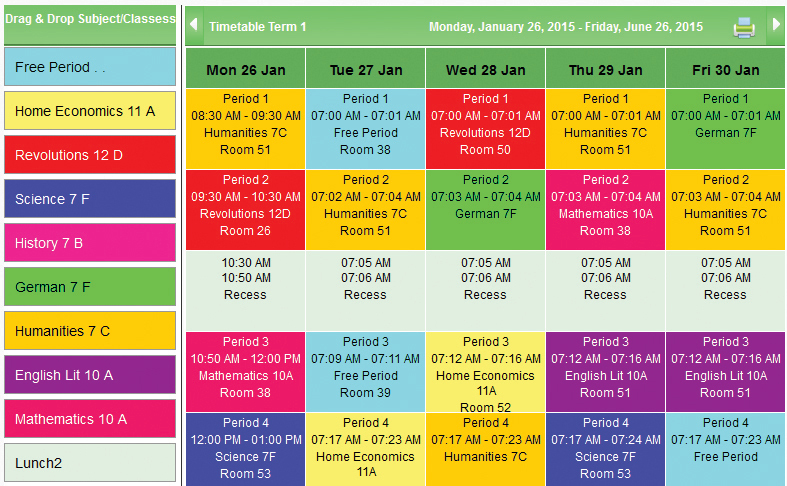 Colour code each of your subjects and classes for easy visual reference and create numerous, flexible timetable configurations to suit your teaching. 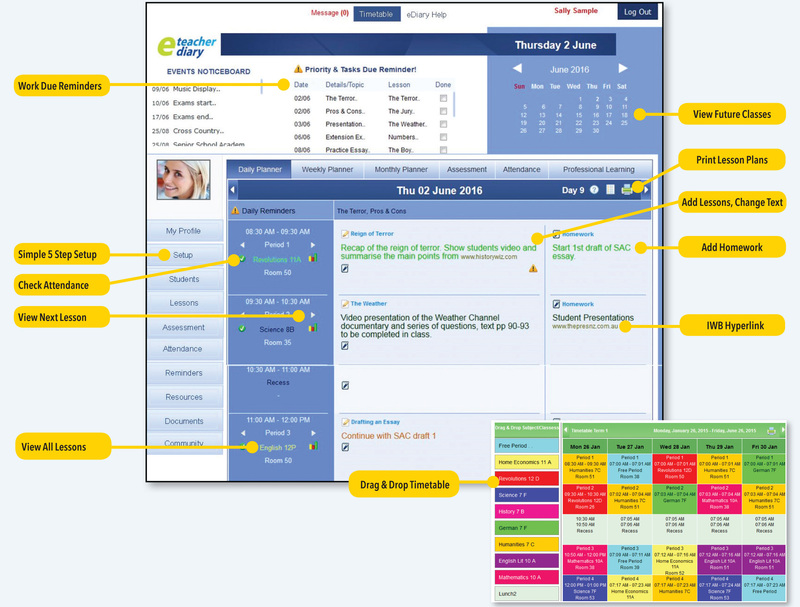 Once setup, your teacher eDiary automatically uploads your complete timetable into the daily or weekly online planner, allowing you to plan for every class, for every period, for every day of the school year. What is the Teacher Diary? The Teacher eDiary is a 24/7 online HTML 5 web-based application using the latest specification server and software accessed by a user email and password. Is the Teacher eDiary secure? The Teacher eDiary is not cloud based. It is stored on our private cloud Australian server using SSL 128 bit high-grade encryption with daily data backups. What device do I need to access the eDiary? It is set up in 5 steps including choosing your timetable settings, adding some classes, non-teaching activities, rooms and then creating your term timetable. Do I need to add students? The Teacher eDiary has inbuilt manuals in each screen, as well FAQs and because it’s based in Australia, you can call us directly for instant help or email your queries. Can I view my lesson plans from my mobile phone or tablet? Yes, our eDiary App allows you to quickly access and view your lesson plans from the convenience of you mobile phone or tablet.